Chappaqua Crossing was designed with sustainable features, including Energy Star appliances, lighting and heating systems, and water conservation features including low flow toilets, shower heads and faucets. When complete, the 700,000-square foot campus will offer a Whole Foods Market, Lifetime Fitness gym, additional shops and restaurants, and over 500,000-square feet of office space. New York State Homes and Community Renewal has provided about $10 million in financing for the project in the form of tax exempt bonds and subsidy. HCR’s Federal and State Low Income Tax credit allocation will generate $5.4 million in equity. Other funding sources include $4.1 million from Westchester County. Wilder Balter Partners Inc. is a leading developer of award-winning, new construction homes in the New York metropolitan area. Since 1975, Wilder Balter Partners Inc. has built affordable residential communities and luxury homes in Westchester, Suffolk and Fairfield County and the Hudson Valley. 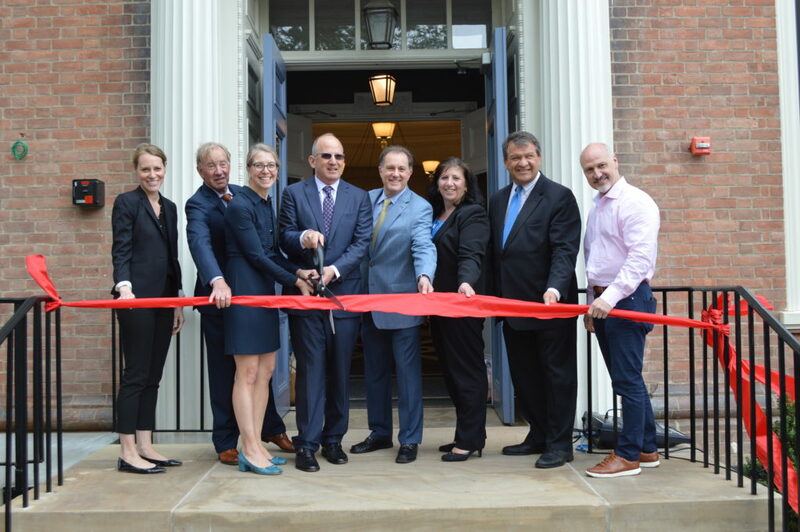 New York State Homes and Community Renewal and Wilder Balter Partners announced the completion of a $21 million affordable housing development in the Chappaqua section of the Town of New Castle in Westchester County on June 7, 2018. The Chappaqua Crossing Apartments, located in the renovated Cupola Building of the iconic Reader’s Digest headquarters property, include 64 mixed-income apartments on a sprawling campus that will also include a variety of retail and commercial spaces. Left to right, Tricia Yarger, Director, Municipal Securities Division, Citi Community Capital; Robert H. Wilder, Jr., Principal, Wilder Balter Partners, Inc.; RuthAnne Visnauskas, Commissioner/CEO, NYS Homes & Community Renewal; William Balter, President, Wilder Balter Partners, Inc.; Victor J. Sostar, Executive Vice President, Regions Affordable Housing; Norma Drummond, Acting Commissioner, Westchester County Department of Planning; George Latimer, Westchester County Executive; Robert Greenstein, Supervisor, Town of New Castle.